SAN DIEGO, Jan. 11, 2019 /PRNewswire/ -- General Dynamics NASSCO held a ribbon-cutting ceremony today to commission its new panel line, which expands steel production capabilities for the construction of commercial and government ships in San Diego. "Our team scouted thin plate welding technology and processing facilities from around the world to identify the components that would allow NASSCO to stay at the forefront of shipbuilding manufacturing technology," said Kevin Graney, president of General Dynamics NASSCO. "This facility, the only one in the world with this unique combination of technologies, is already beginning to transform our business while reducing energy consumption and emissions," said Graney. 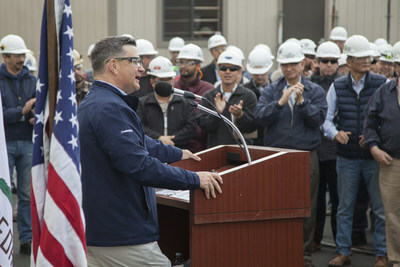 "This facility is a win for NASSCO, our customers and our region."